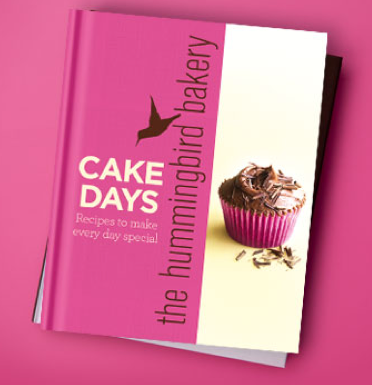 I've been considering buying Cake Days, the Hummingbird Bakery's second cookbook, for a while now. Unfortunately, since the Hummingbird Bakery is based in England, I was unable to find any copies of the book in any US bookstores. I've considered buying Cake Days through Amazon, but I was hesitant about going through a third-party seller. I've always been aware that an iPhone app of the book existed, but I was reluctant to buy it for two reasons. The first one is that I refuse to pay for apps on principle. There are a ton of awesome, free apps out there so I think it's pretty unnecessary to shell out money for an app -- especially one that costs $4.99. The second (and perhaps less irrational) reason is that I find it a little heartbreaking to buy an electronic/app version of a book. I've resisted the whole Kindle/e-tablet trend for a while now; since I spend the majority of my day staring at two screens at work, I really don't want to spend my free time doing so. God knows I already spend enough of it on screens anyway, especially considering this blog and my recent Pinterest addiction. Besides, there's something really satisfying and lovely about having a tangible, physical book in my hands that I can't quite shake. What's more is that the app would essentially be substitute for the cookbook -- but aren't cookbooks supposed to be physical things, filled with mysterious stains and beautiful full-page photos? I've wasted a lot of time browsing through my small collection of cookbooks, brainstorming for ideas and oohing and aahing at pretty pictures of delicious food. And you really just can't do that with an app. However, after quickly cracking the Hummingbird lemon cupcakes recipe last weekend, I realized that if my theory about "mother recipes" holds true, I would quickly breeze by the rest of the Hummingbird Bakery's Cookbook's cupcakes recipes. So I caved. I bought the Hummingbird Bakery's Cake Days app. Only the third app I've ever paid for in my life (the first two were Angry Birds and the Savage Love podcast, in case you were interested), and the first electronic book I've ever bought. I was especially excited that the app included 27 new recipes for different flavored cupcakes! Hummingbird versions of some of my favorite flavors, including rose, Earl Grey tea, and malted chocolate. I could not wait to try these new recipes! However, I wasn't particularly sure about the structure of the app -- though, to be fair, it was simply following the layout of the original Cake Days cookbook itself. Cake Days has its recipes organized by occasion instead of type -- that is, the book has a section for Valentine's Day that includes cake, whoopie pie, and cupcakes recipes, as opposed to the more conventional format of organizing recipes by cake type (a section for cakes vs. a section for whoopie pies vs. a section for cupcakes, etc). From there, it breaks the recipe down into a page dedicated to each step in the recipe. Simply slide your finger across the phone to get to the next step -- OR, if you want to get even more high-tech, you can turn on the app's "clapping" feature. This enables you to switch to the next step in the recipe simply by clapping! Again, very cool. I can imagine this would be especially handy for the times when my hands are covered in gross ingredients like flour, eggs, and butter. Other neat features include an interactive shopping list -- simply view the ingredients list for each recipe and add the items you need to your shopping list for reminders. A much neater way to organize things, as opposed to my usual method of scribbling shopping lists on odd scraps of paper. There also videos -- mostly instructional cooking videos for different recipes, but some neat ones including one on how to create the signature Hummingbird swirl on your frosted cupcakes. Although I'm still a little bit ashamed of myself for buying the app version of the cookbook, I'm pretty pleased about my purchase overall. The app is elegant and will admittedly change the way I bake. How much? We'll just have to see, I guess. And at the end of the day, I have to admit -- that clapping technology thing is pretty friggin' cool.